Alan Chan has turned around KFC’s flagging fortunes in Hong Kong, transforming the franchise into a much more appetising proposition. Published in the February 2019 issue of CEO Magazine. Even worse, Hong Kong locals perceived KFC as a chicken-only restaurant. In response, Alan brought in a new strategy called ‘Chicken and More’. Fried chicken was still the mainstay of the menu, but it also aimed to offer more options to customers. But Alan knew there was no point in offering ‘more’ if it couldn’t be clearly defined, otherwise it would just be offering options that were either irrelevant or made no sense at all. Further, KFC introduced a breakfast menu that currently accounts for around 10% of the Hong Kong and Macau business. Part of the reason behind the decision, according to Alan, was due to the ease in being able to tie in rice and chicken with breakfast as a whole. The breakfast menu consists of two main categories. On one side are the chicken hamburgers, while on the other side are the entrees, such as scrambled eggs, toast and a piece of chicken. “When you look at our menu, we serve entrees, we serve hamburgers, but predominantly most of the menu items are entrees with chicken fillet and a hamburger with a chicken patty,” Alan says. But Alan didn’t immediately reduce the prices of all KFC products. Rather, he put a hold on any future price increases to make sure that all of its competitors caught up. “Right now, I can say KFC is at least on par when it comes to menu pricing. Some of the items on the menu are even cheaper than those of McDonald’s,” he says. In three years, he was able to practically close the price gap between KFC and its main competitor. In addition, there was also a complete overhaul of KFC’s operations. That included finding the right people as well as “letting go of some really bad people” in order to boost morale. But in an organisation with around 3,000 employees, properly engaging with all of them face to face would be next to impossible. Alan needed to adjust his approach. Instead of spending one-on-one time with all employees, he narrowed his one-on-one engagement to just the full-time employees. “2,500 of them are part-time students and housewives, while 500 of them are full-time,” he explains. The more personal, individualised approach also applied to suppliers: people like PepsiCo General Manager for Foods and Beverages in Hong Kong, Simon Wong, whom Alan has known for the seven years since he joined KFC. Then there is Oriental Engineering, a family-owned business run by two brothers whom Alan has known for 25 years, from all the way back in their McDonald’s days. They now supply the soft-serve ice-cream machines and are developing new ideas for soft-serve for KFC. Part of treating suppliers as friends is making sure they also make money out of the business relationship, something that Alan says he learned from McDonald’s founder, Ray Kroc. “One of Kroc’s biggest concepts that struck me was that, in managing the supply relationship, he always made sure the supplier made money first before he got his,” he explains. But whether it would be a major supplier or a housewife working part time at the front of the restaurant, Alan would rather have people call him by his first name. “It’s very common in Chinese society to address your boss as ‘Mr Chan’. I refuse to have people calling me ‘boss’, or anything like that. I insist on them calling me just ‘Alan’. I just treat them as my friends,” he says. Whereas McDonald’s was already an established worldwide chain, and resourcing issues there are usually minimal, it was a very different situation at Triple O’s. Alan had to oversee the day-to-day: whether the shops ran to time, whether he had sufficient cash to pay bills, or whether he had enough revenue for the next few months to cover all expenses. “I think the biggest lesson I learned at Triple O’s was that I had to roll up my sleeves. You work hard every day and you have to be a real entrepreneur to run the business, because it is so small. It really helped me to find a missing piece in my career as a manager or as a businessman,” Alan says. In creating the most effective strategy in managing people, Alan also drew inspiration from the book Gung Ho! by Ken Blanchard and Sheldon Bowles. Most notable in the book, according to Alan, was how it encapsulated employee turnaround within an organisation in three Native American lessons: The Spirit of the Squirrel, The Way of the Beaver, and The Gift of the Goose. “The squirrel represents focusing on what matters the most in work, the beaver represents managing the necessary processes in achieving the goals, and the goose represents working as a team and cheering each other on,” Alan summarises. Over the seven years he has been at KFC, Alan always talks about the three animals in workshops he hosts for employees, and tries to embody the spirit of those animals within the company. Now, according to Alan, ‘the squirrel’, ‘the beaver’ and ‘the goose’ have become common language in the company. Alan is well aware that, when someone makes it to the top, it can be very easy for them to have “some ego”. The experience at Triple O’s, however, taught him the importance of humility; that it is okay to not know everything and direct people, but to inquire and ask questions. It has helped to keep his ego in check, something that arguably he might not have been able to do had he gone straight to KFC from McDonald’s. Alan also recognises that McDonald’s has been doing a much better job than KFC on the community engagement front. So last year, KFC started a food-donation program in partnership with Food Angel, a Hong Kong charity that helps the underprivileged by providing lunch boxes and dinner meals. In addition to donating food, it is also sending some of its employees to volunteer in the Food Angel kitchens. 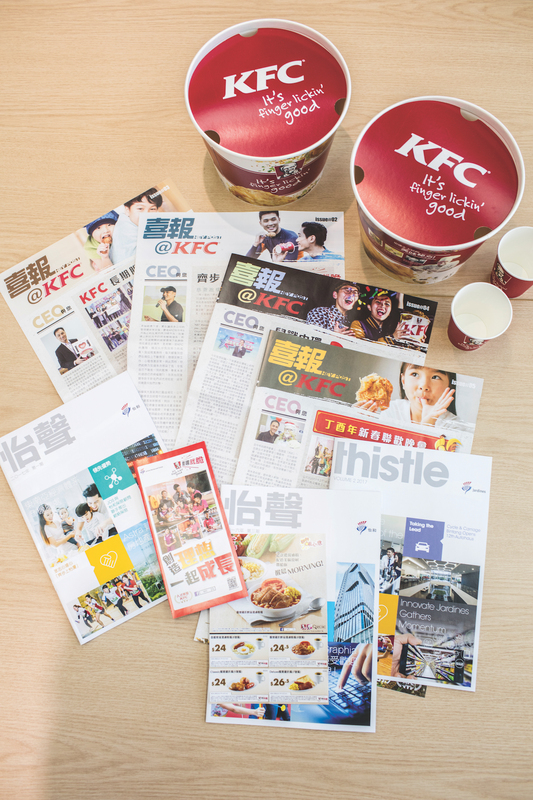 Through such programs, Alan hopes KFC can form a more meaningful connection with the Hong Kong people. Birdland currently operates 71 KFC outlets, 66 in Hong Kong and five in Macau – way behind McDonald’s, which has 240 outlets in Hong Kong and 28 in Macau. Most importantly, Alan believes, KFC’s turnaround in Hong Kong was all about getting the basics right: serving good food fast and providing a hygienic and clean environment for the customers.